With the market high, Buffett would wind down his fund in 1969 and "retire". In so doing, he returned a lot more money to his partners than they had invested with him over the years. To partners who sought Buffett's opinion on who should manage their funds, Buffett suggested Munger and two others of whom he had high opinions. Buffett did not convert all of the partnerships' holdings to cash. Partners also received their interest in stock of Berkshire Hathaway and a couple of other companies. Buffett did offer cash or notes in return for these shares, though he added that he would likely continue to buy shares of these companies. To their future economic detriment, many partners sold out. It is around this time that Buffett came across See's Candy, one of his more famous investments. The offering price for the company was a whopping 5 to 6 times its book value, which almost resulted in Buffett not making the purchase. But Munger, who Buffett brought in as a partner on the deal, absolutely loved the business. The company generated extraordinary returns on capital, and Buffett saw the potential for price increases that would result in even stronger profits. Buffett and Munger were able to buy it at about 11 times earnings, and it has been an extremely profitable purchase for them. Throughout this period, Buffett also sought media companies. 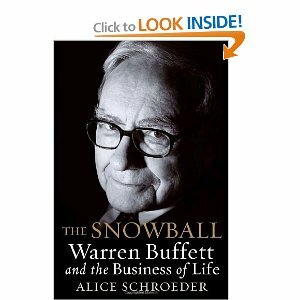 The author remarks that had he not gone into investing, Buffett would likely have gone into journalism, such was his interest in the field. Buffett would buy a couple of small newspaper outfits, but found the top-tier companies too pricey at first. For one of the papers he owned, Buffett would apply his skills to help the paper win a Pulitzer Prize, as the story uncovered a $200 million+ portfolio for a charity that claimed to be in the red. More on that here.